A team of students from Moate Community School (MCS ) have reached the national finals of the Young Social Innovator (YSI ) Awards 2016. MCS is the only representative from Westmeath to reach the final. The class of TY2 in MCS chose the topic of ‘Sexism in Irish Football’ as their project’s focus. 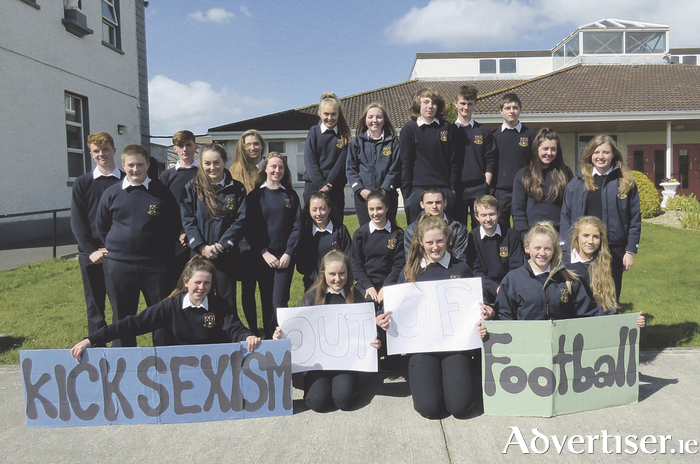 Assisted by their teacher, Ms Yvonne Prendergast, the class named their project ‘Kick Sexism out of Football’. The students completed numerous activities in order to raise awareness for the need to support ladies who play football. They spoke to RTÉ sports presenter Jacqui Hurley who increased their knowledge of the issue. They gave talks to students in their school and showed a video they created on the topic which shared the opinions of more than 200 people the students surveyed. The class also put great effort into promoting their school’s senior ladies football team. They made banners and posters to raise awareness about the team’s matches and highlight their success on reaching the Leinster finals this year. They also made and sold headbands in the ladies’ team colours. To reach a wider audience, they set up a Facebook page called ‘Kick Sexism out of Football TY2 MCS’. Recently, the class organised an awareness event attended by students, the school’s ladies football players, and by Roscommon manager Kevin McStay and current County Westmeath Ladies chairperson Geraldine Giles. Both guests presented their opinion on the issue and voiced their support for ladies football. The students are currently inviting local clubs and secondary schools to display a ‘Support Ladies in Football’ certificate in their clubhouse or school. This certificate is endorsed by MCS teacher and county player Des Dolan, who has been supporting the students with their work. It is hoped that the displaying of this certificate will put a responsibility upon each club and school to show ladies football the support it deserves. The YSI national final takes place on May 10.